Hocus-pocus is nowadays applied to meaningless talk or activity or to anything, speech or action, that’s designed to stop you seeing what the politician or salesman is really up to or what’s actually happening. This budget, like so many before it, is an act of deception, a piece of political hocus-pocus designed to make us believe councillors are spending our money wisely. Ottawa Citizen, 31 Jan. 2010. If it goe from de Nature of de ting, it is de more Art; for deare is Art, and deare is Nature; yow sall see. Hochos-pochos, Paucos Palabros. The Masque of Augeres by Ben Jonson, 1622. 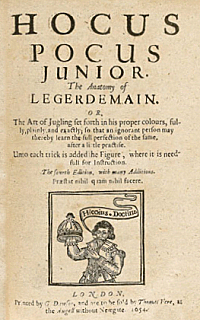 A famous appearance is in the title of the first book ever published in English about conjuring, Hocus Pocus Junior, The Anatomy of Legerdemain, of 1634, which was popular and went through many editions. In his book Magic on the Early English Stage of 2005, Philip Butterworth identifies the previously unknown author of this little book as William Vincent, a famous conjuror of his time, who was appointed as juggler to King James in 1619 and who used the stage name Hocus-Pocus. At this time there was no formal separation between jugglers, rope-dancers, conjurers and other performers, whose acts were summarised as “feats of activity”. Vincent did them all and was particularly known for his ability to swallow and regurgitate daggers. I will speak of one man ... that went about in King James his time ... who called himself, The Kings Majesties most excellent Hocus Pocus, and so was called, because that at the playing of every Trick, he used to say, Hocus pocus, tontus talontus, vade celeriter jubeo, a dark composure of words, to blinde the eyes of the beholders, to make his Trick pass the more currantly without discovery. A Candle in the Dark; or, a Treatise Concerning the Nature of Witches and Witchcraft, by Thomas Ady, 1655. Vincent certainly popularised the term and became identified with it. He may well also have invented it; we have no way of knowing. What is also unknown is where it came from. Many people today believe it originated in a corrupted form of the words of the consecration of the host in the old Latin mass: hoc est (enim) corpus (meum), “this is my body”, an idea first aired by John Tillotson, Archbishop of Canterbury between 1691 and 1694. But as this was part of an anti-Catholic sermon, it may be taken with a fair-sized pinch of salt. Another possibility, suggested in current Oxford dictionaries, is the nonsense Latin phrase hax pax max Deus adimax. Whatever the source, hocus-pocus was at first a term for jugglers and conjurers as well as a conjuror’s incantation. Later in the century it evolved to mean a trick or deception. It may also be the source of another common English word, since some authorities suggest that at the end of the following century its first element was contracted to make hoax. Last modified: 27 February 2010.